Powers/Abilities: The Needle's one good eye gives off a hypnotic and paralyzing stare that can freeze other human beings where they stand. He carries an 3' long, oversized sewing needle with him, which he can use as a weapon, as well as numerous standard needles which he uses to stitch the mouths of his victims shut. The Needle has remarkable, if not superhuman, agility and above-average endurance, able to recover quickly from Spider-Woman's venom-blasts. The Needle is mute, though it is unrevealed if he was already like this or lost the ability to speak during the attack that released his hypnotic powers. During the brief period he was empowered by Satannish, the Needle possessed athlete level strength, stamina, durability and agility. He is an expert tailor and fair hand-to-hand combatant. (Spider-Woman I#9 (fb)) - The elderly man who would become the Needle was attacked by a group of hoodlums as he left his tailor shop. He was hospitalized , having lost the use of one of his eyes in the process. While laying in the hospital bed, the rage within the old man grew until he was able to use his remaining eye to cause paralysis in others with just a stare. Six months later, he was released from the hospital, and began designing a costume, intent on striking out at young males like the ones who had brutally beat him. (Spider-Woman I#9) - Jerry Hunt came across the Needle as he was attacking a young man and the man's girlfriend in an alleyway. Hunt tried to stop the vigilante, but was paralyzed by the Needle's stare. To punish Hunt for interfering, the Needle sewed his mouth shut just as he had his previous victims. The Needle then fled. Hunt's friend Spider-Woman began to investigate later, and came across one of the Needle's fresh victims, but was unable to capture the vigilante. He returned to his tailor shop, content that he had exacted revenge against four more men that night. The next night, the Needle once again came across Hunt, who was searching for him with the help of Spider-Woman. The Needle paralyzed Hunt yet again, but before he could mutilate Hunt a second time, Spider-Woman arrived. The two fought briefly, with the Needle thinking he had succeeded in paralyzing the hero. However, as he moved in to stitch her mouth shut, she zapped him point blank in the chest with one of her venom-blasts. This was enough to stun the Needle, and with the police arriving at that moment, the Needle was taken into custody. (Spider-Woman I#50 (fb)-BTS ) - At some point, the Needle was captured by Locksmith and Tick-Tock and placed in their personal prison along with several other Los Angeles-based superhumans. (Spider-Woman I#50) - Needle was placed in a cell with a blindfold covering his eye to keep him from using his power. After Locksmith captured Spider-Woman, she was able to break free and defeat Locksmith after releasing several of the other prisoners (Needle not among them). (Captain America I#330 (fb)-BTS) - The Shroud recruited Needle into the Night Shift, though Needle was unaware of Shroud's true motives. (Captain America I#330) - Needle was among the Night Shift members who arrived in time to help Captain America fend off a group of the failed mutates dumped in the Los Angeles sewerways by the Power Broker. Captain America and the Night Shift then led a surprise assault on the Power Broker's mansion, and as the vigilantes keeping the bodyguards busy (with Needle stabbing one through the back), Captain America left to find the Broker. (Captain America I#331) - Needle and the rest of the Night Shift departed after the battle, but returned that night with the mutates they had rounded up, in order for Jackson to cure them. (Solo Avengers#3/2) - Needle and the Night Shift watched as Shroud battled Moon Knight in a test to see if Moon Knight was worthy of taking over the leadership of the Night Shift. (West Coast Avengers II#40) - After their teammate Digger was captured by the inactive Avenger Mockingbird, the rest of the Night Shift (sans Shroud) attacked the Avengers' West Coast compound in an attempt to demand his release. 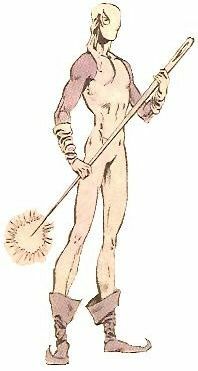 Needle tried to hold the housekeeper Yolanda Russo hostage, but Wonder Man's timely arrival led to the Shift's defeat. Shroud, previously unaware of his team's venture, arrived and freed the Shift. (Avengers West Coast#76) - When the Hangman (secretly working for Satannish) ousted Shroud as leader of the Night Shift, he led them on an assault on Hollywood filmmaking, playing up their secret desires. They twice attacked the set of a movie Hangman had once been part of, and fought Wonder Man, who had a part in the film. They ended up capturing Hawkeye, USAgent and Spider-Woman (Carpenter). Needle and and the Shift then held a ceremony calling forth Satannish. (Avengers West Coast#77) - The other Avengers arrived in time to stop the sacrifice, but after another fight, the Shift escaped. They next took Wonder Man and others on his film hostage. (Avengers West Coast#78) - Needle and the others continued forcing the kidnapped crew to film their vanity project movie, and when USAgent tried to stop them, they took him captive as well. (Avengers West Coast#79) - Needle and the others, granted heightened abilities by Satannish set out to get their next battle with the Avengers televised across the world. As they battled, Satannish appeared, growing stronger within Earth's dimension as more people watched the incident on television. When Dr. Strange arrived, he revealed that Satannish had taken partial souls from the Night Shift members, and, enraged, Needle joined his teammates as well as the Avengers in sending Satannish back to his own realm. Needle and the others lost their Satannish-powers in the process, and were handed over to the authorities. (Captain America I#420) - After the Blazing Skull (Jim Scully) attacked Digger, Needle joined Misfit and the Brothers Grimm in coming to his rescue and finding that Captain America had joined Scully. Needle was knocked out by Captain America during the fight. (Avengers: The Initiative Annual#1/2 (fb)) - The Needle was defeated by neophyte hero Armory (Violet Lightner) in San Francisco. (Marvel Zombies 4#2 (fb) - BTS) - The Night Shift including Needle was recruited into the Hood's villain army. (Marvel Zombies 4#2) - The Hood called the Night Shift (Dansen Macabre, Digger, Needle, and Tatterdemalion) to accompany him to a meeting with the Black Talon on the Island Nation of Taino to discuss the purchase of an other-worldly virus that induces zombification. Sensing the presence of the Midnight Sons, a group organized to eradicate the virus, the Hood sent the Night Shift to stop them from interfering. 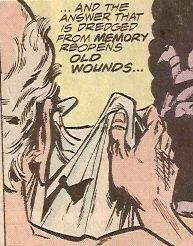 Ambushing the Midnight Sons, the Night Shift was soon overpowered, Tatterdemalion set ablaze by Daimon Hellstrom, Needle blasted by Jennifer Kale, Dansen Macabre bitten by Morbius and Digger having his shovel wedged into his head. Regrouping, the Night Shift lurched forward, ignoring a warning from their foes that the plague approached. The plague tore the Night Shift apart, disintegrating their remains. (Marvel Zombies 4#4 (fb) - BTS) - Dormammu resurrected the Night Shift and sent them after the Midnight Sons to distract them while he wrested control of the plague. (Marvel Zombies 4#4) - Bursting into the Black Talon's plantation while the Midnight Sons and a powerless Hood worked to stop the plague, the Night Shift was held back by the Hood, Morbius, and Hellstrom. (Moon Knight VI#3) - Night Shift (Dansen Macabre, Digger, Misfit, Needle, Tatterdemalion, Tick-Tock) were hired by LA crimeboss Snapdragon (Sheoke Sanada, acting on orders from Count Nefaria) to seek out and capture Moon Knight. (Moon Knight VI#4) - The Night Shift caught up with Marc Spector who was having a talk with Maya Lopez (the deaf vigilante Echo) outside on a bench. When Spector refused Tick-Tock's polite invitation to accompany them, the Night Shift attacked. Tick-Tock tried to shoot Echo, but ended up hitting Tatterdemalion instead. In response, Echo knocked out Digger and used his shovel to stab Tick-Tock. The two Avengers managed to defeat the Night Shift, who were arrested by the police. (Moon Knight VI#5 - BTS) - The Night Shifters were released from jail after their lawyer made the case they really were the victims of two outlaw vigilantes beating on them. (Moon Knight VI#6) - Snapdragon brought Needle and the other Night Shift members to meet with her boss who wanted to discuss why the six of them had failed to capture the two heroes. Nefaria insulted the team for their bumbling incompetence, which they took offense to. But before anyone could act, they were incinerated by Nefaria's ionic energy blast. As the Night Shift's remains continued to smolder, Nefaria turned to Snapdragon and requested she aimed a bit higher the next time she hired outside help. Comments: Created by Mark Gruenwald, Carmine Infantino and Al Gordon. Spider-Woman remarked that the Needle's and her paralyzing powers were so similar that they were effectively immune to one another. Needle received a quarter-page entry under the Night Shift profile in OHOTMU Update '89#5 and a solo profile in Master Edition#27. The ME says the needle he carries is three feet long, but it certainly appears to be longer than that in its appearances. The Needle spoke one line of dialogue in Avengers West Coast#76, put I'm pretty sure that was an error. Needle received a real name in Spider-Woman (Drew)'s profile in OHOTMU A-Z HC#10.